On January 21, I sat down with newly elected Sheriff Lombardo to find out who he is, where he has been, and what he sees as the future for the men and women at LVMPD. Having broken my ankle a few weeks back, I “strolled” into the Sheriff’s office on my awesome four-wheel scooter (with metal basket attachment, of course), sat down with the boss and asked the following questions. I was hired by the LVMPD in September of 1988. After the Academy and field training, I was assigned to the Northeast Area Command. I spent my time at NEAC covering foot patrol on Fremont Street and the David area. When I was able to, I became an FTO and spent a few years doing that assignment. From there, I spent the next six years as a Narcotics detective. I promoted out of Narcotics and became a sergeant, and later an FTO sergeant. I then spent time in the Weed and Seed task force at NWAC, which primarily focused on the William area. I went back to Narcotics for about three years and again promoted out of Narcotics, this time to lieutenant. During my time as a lieutenant, I was assigned to Patrol, Air Support and the Office of the Sheriff. It was during this time that I attended the FBI National Academy. While at the Academy, I was promoted to captain. As a captain, I was assigned to SWAC/EAC and the Homeland Security Division. From there I promoted to deputy chief and later assistant sheriff. I then went on to a short stint as the acting undersheriff until my election as Sheriff. Is there an assignment on the Department that you would have liked to work, but never had the chance? I really would have liked to work in Homicide. That type of work always intrigued me, but I never got around to getting to that detail. Other than command staff, what was your favorite assignment in your career? I had the best time working as a Narcotics sergeant. How will the next four years be different than the previous? What new ideas or concepts do you plan to bring to the Department? One of the biggest changes is going to be decentralization. Captain Anderson has been appointed to be in charge of the implementation and execution of decentralization. This change should be effective by July of 2015. I believe that we need to focus some of our specialized units that are not primarily assisting the crimes-against-persons issues and refocus them toward reducing these types of crimes. Areas like street robberies would be better suited to helping reduce violent crime in the valley, while still keeping the task forces in place to handle business and series robberies. By creating hybrid squads at area commands, these detectives can be cross-trained in different areas of law enforcement and better help individual areas and be target-specific in those areas, much like LAPD and NYPD. I also believe that having these resources P# 3497 at the disposal of the area command captains will better benefit the citizens living in those particular geographical areas. I think this will also provide patrol officers more opportunity for advancement to these specific areas. What are some of the hot-button issues that need to be addressed ASAP? 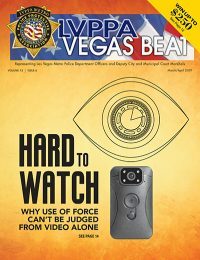 Use of force is a very hot topic, not only in Nevada, but all over the nation. Society is showing that the current way of handling police officers’ uses of force needs to change and cannot operate the same way it has in past years. We have to look at how we address these issues and how better to use our de-escalation techniques to resolve situations. With the issues between the County and LVMPD regarding More Cops, are we still going to be pursuing the More Cops initiative and, if so, how will you succeed? We are always exploring more options to increase the number of officers on the street. To be successful with the More Cops initiative, I think we need to educate the public better about the initiative, along with having all entities involved standing together at the podium at the County Commission meetings and being united with our need for more officers for all of us, not just LVMPD. What do you think of the new use of force review process? or not, and that was the end of it. We would not look at the tactics of the incident itself and, when necessary, provide the training to the officers or make changes to policy to make the officers’ jobs better. Are there any plans in the future to open a new substation? The plans to expand and open a new area are always there. Currently we don’t have the manpower to staff an entire station. Should we reach the day where we were able to staff a station, we would more than likely use an existing structure as the substation. Where do you see our Department going with regard to body cameras? Also, what would the associated costs be with implementing these for all of Patrol? setting up the infrastructure. We would then look to make the cameras a line item in the budget to continue to purchase the cameras. As of December 2014, the cameras have cleared approximately 22 IAB complaints in favor of the officer. What is the Department doing about getting the North Valley complex staffed? We are currently in talks with the County to make that a line item as well. Currently, every correction officer position there is an overtime assignment. It would be better for LVMPD to staff those positions at straight pay for a CO rather than paying the overtime. Are there any plans to bring Ted Moody on board with the Use of Force Board in any capacity? from his many years as a police officer. Do you think the morale at the LVMPD, with regard to POs and COs, is low? of the people above them second-guessing the decisions they made. I want to empower the supervisors to know they can make those decisions and need to make those decisions on their own. And one final question, since we are doing this a week-and-a-half before the Big Game: Who do you like, the Patriots or the Seahawks? When the meeting was over, Undersheriff McMahill came into the office and told Sheriff Lombardo that they needed to go. Sheriff Lombardo thanked me for the interview. I loaded myself back onto my scooter and headed for the door. Sheriff Lombardo said, “Hey, you need a nice bell or horn on that ride of yours.” I then rolled off into the sunset. Happy trails from Scooter, everybody!